Minoan Moon Publishing, 9780990337003, 32pp. It all started at the carnival. . . .
That's where Joey makes a new friend: a bright yellow balloon. Joey and his beloved balloon do everything together, until the balloon accidentally slips off Joey's wrist and flies far, far away. What will Joey do without his special friend? Tiffany Papageorge has always had a profound love for stories. She earned her MFA in Acting from the American Conservatory Theater in San Francisco. Through her extensive theater background, which spans a 25-year period and includes work with CBS and Disney, she learned firsthand how stories deeply touch and affect the human spirit. As an author and public speaker she works with parents, teachers, and mental health professionals who want to find new ways to reach, capture, and engage children, including those who are dealing with the issue of loss. She also works with children directly through story to help them grow, heal, and flourish. She and her husband, Paul, live in Los Gatos, CA, with their three children. 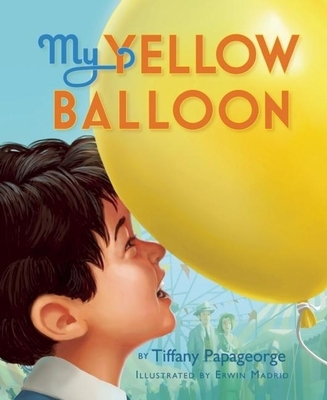 My Yellow Balloon(TM) is Tiffany's first children's book. Erwin Madrid was born in the Philippines and grew up in San Jose, California. He earned his BFA in Illustration from the Academy of Art College in San Francisco, CA. During his last semester of college, Erwin was hired by PDI/DreamWorks Animation where he contributed production illustrations for the animated feature film, Shrek 2. He later became a visual development artist for the Shrek and Madagascar franchise and Megamind. Erwin has also done conceptual art for the video game industry for titles like Uncharted: Drake's Fortune. He now works full time as a children's book illustrator.